The final month of school is approaching. A school year's worth of work is being measured and in a blink of an eye graduation will be here. Thinking of these final weeks of school, check out these essentials to ensure you finish as strong as you started and have a plan to be ready for whatever may lie ahead. 1. Take Inventory. As the year wraps up, reflect on what worked and what didn't in your instruction of either your students or your staff. Don't allow the argument of time stop you from this occurring. Reflection is a constant part of our work. 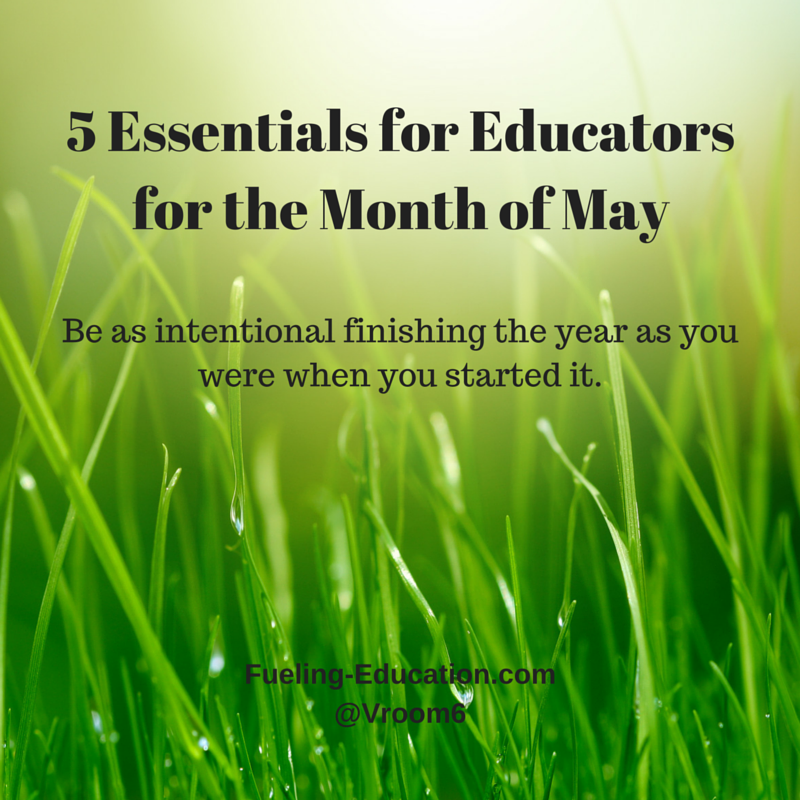 Think back to your year and take a month by month glance of what was successful and what needs tweaked as you plan for the upcoming school year. Be ahead of the year that will be here before you know it by reviewing the year you just completed. Come August you will be glad you did. 2. Think Forward. Now that you have notes of the year almost over, create a blueprint for what lies ahead. Just as you should be reflective of the work in your past, be just as ready for the year ahead. Spend a few moments and chart out what the days and weeks will look like when students and staff return. Think forward to the lessons you plan to teach and allow for the summer months to be a part of refining the instruction. 3a. 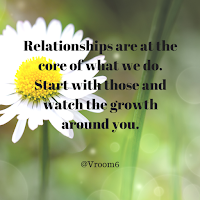 Relationships at the Core - Your Students. As you head into this final month of work, take a look back at the relationships you've established with your students. 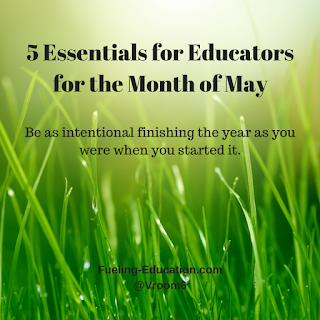 Focus in on making the final month of school the most important. For many of your students, regardless of your demographics, school is the highlight of their day. Be there for them, engage in conversation, be reflective on the content covered and discuss what their summer of learning could look like with their peers. Guide them to be ready for the return after a few months away. 3b. Relationships at the Core - Your Staff. One of the best ways to take inventory of a year is to be transparent enough to ask those you work with and get their feedback. Consider gaining your teachers perspective of where your building is in its growth through the sharing of a staff satisfaction survey. 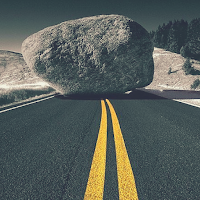 Weighing in on vision, communication, community and accountability, every person on a the team can own the accomplishments and the work left undone. 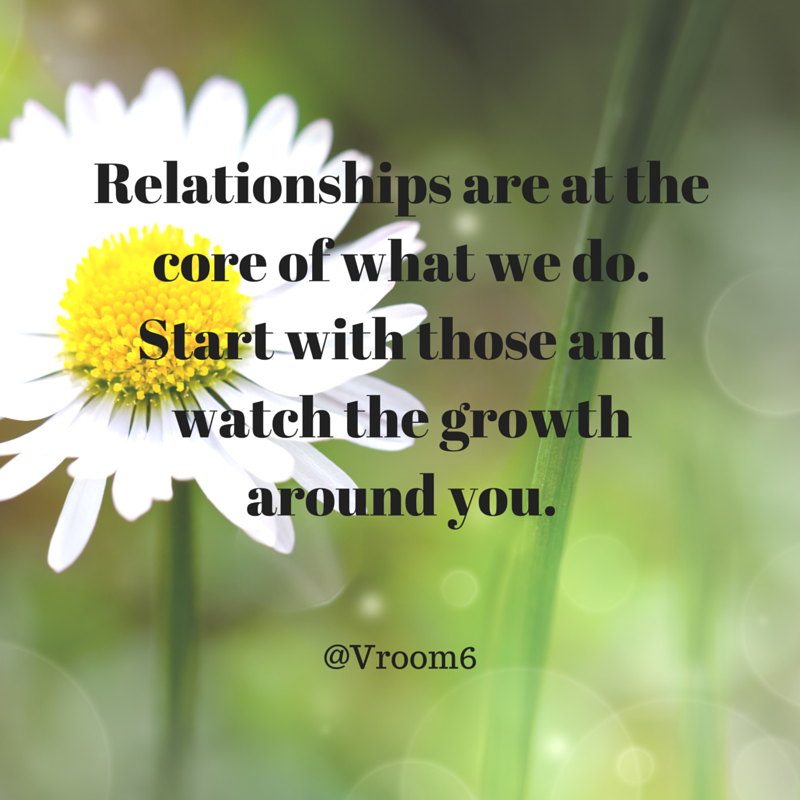 In addition, focus on the relationships that have blossomed and those that need attention. Get your mind right and be ready to put even more purpose into all relationships after a summer away. Have an intentional plan for building leaders up and focusing on getting the power of the team in play. 4. Summer Growth. Plan your summer professional development now. After a school year of embedded professional learning, district opportunities, collaboration with colleagues and more, have a detailed plan of how you will extend your learning throughout the summer. Take advantage of local conferences, find an EdCamp in your area (all states are hosting an EdCampLdr in July) and have meet-ups with other educators to talk best practices. 5. Feed your PLN. If you are reading this post, you know the power of being connected. It matters and it makes us better. We are constantly in control of our learning. Whether using twitter, reading blogs, attending online webinars or a host of other connected opportunities, continue to expand your network. Push your four walls of learning even further and be purposeful as you do it. Find your niche of colleagues that will add depth to your work. The final month of school is just as important as the first. All that you have worked to achieve is coming to a head. Celebrate what has been accomplished, make time for what still needs completed and be ready to plan forward. To make the most of your learning, own where you are and where you need to go. You will be better for it. This post is the first in a three-part series. 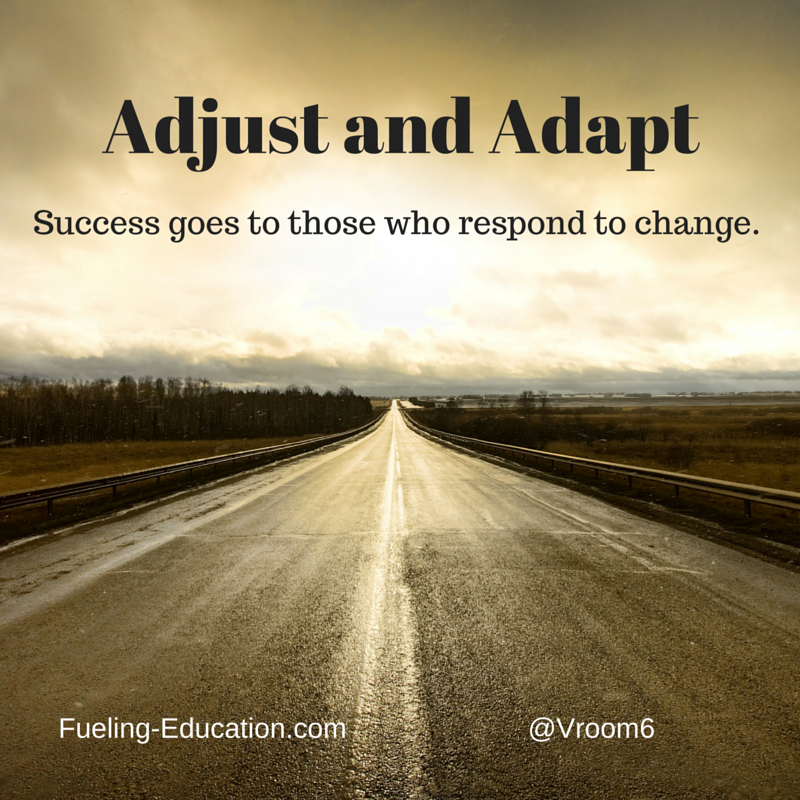 Adjust and Adapt is the fourth component from The R-Factor from Focus 3 Culture. Introducing change is complicated enough. Talking about it and its implications can be that much more of a challenge. The next post will focus on "Getting Your Mind Right (to change)" and the third post will address our response to change. Credit is given and gratitude expressed to Tim and Brian Kight, founders of Focus 3 Culture, for their expertise and passion for driving leaders. A new week has arrived and new opportunities will present themselves. For our community of lead learners, our teachers, we will engage in an intentional conversation about our evolving culture and climate. We will engage ourselves in a conversation about change. The kind of change that moves us to be better at our craft. The kind of change that can be uncomfortable. Change is intimidating. The thought of taking a constant and adding chaos is frightening. As educators we tend to work through our week knowing the events of each day. We plan our lessons, we set our goals for learning and we push ourselves to support our students. Change, however, can also be invigorating. It brings excitement. The potential of fresh ideas and a new lens to what could be old and stagnant will bring a pulse to lessons once considered to be scripted and routine. Change allows for our minds to move away from our comfort zones. Our four walls of learning, of teaching, will be expanded if we are open to the idea of change. With change, we have to adjust and adapt. Change is uncertain and unfamiliar. Change is uncomfortable, it is supposed to create growth. Remember, change is inevitable, growth is optional. And, it is how you respond to that change that will define the leader you are and will become. Whether in front of a classroom of students or a room full of teachers, it is how you respond to that change that will measure your success. How do you deal with change? Do you respond in a manner that will drive you to become better? Do you lead by example? 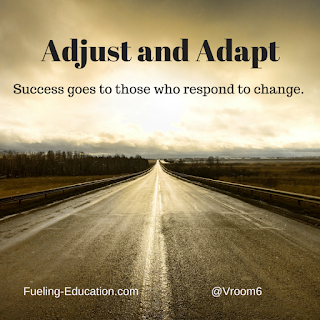 Regardless of our role, we must recognize the need to adapt and adjust. Be reflective on how your actions represent not only your own leadership but also those of your organization, your classroom and the life you live. 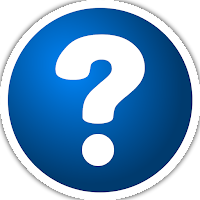 Not that long ago I wrote a post from the perspective of my current role as building principal in which I shared out the question, "So, You Want to Be a Principal?" What (at the time) was just a listing of the attributes that I felt were significant to those considering taking on this charge, became a post shared countless times over by my peers with great feedback from many. Little did I know it would have the impact that it has. A humbling experience. With that in mind, I share this. It is the time of year in the school calendar in which thousands of soon-to-be-graduates and countless substitutes teachers are feverishly filling out the endless on-line applications in the hopes of landing one of the few coveted jobs that exist in today's ever competitive educational market. Some jobs more desired than others, it is an opportunity for our newest generation of teachers to set themselves apart from the competition. For those of us already fortunate enough to be given an opportunity to teach we know what it takes to do this job. The countless hours, the growing needs of our community and the mandates passed down from above, teaching is not easy. Yet, we still come to work each day excited for what lies ahead. Teachers are unique in every sense of the word. 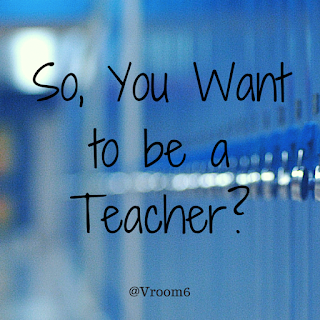 So, You Want to be a Teacher? Well, you may want to check what it will take as you jump in with both feet to this profession that so many of us are already fortunate to be a part of. 1. Be Connected. For the past two years I have participated in countless twitter chats in which I have been impressed and amazed by the number of pre-service teachers that are participating to expand their knowledge. These up and coming future teachers embrace the power of social media to grow themselves as learners. With that, being connected will literally connect you to thousands of other educators before you even are handed the keys to your first classroom. 2. And, be Digital. It is difficult to find districts that are not already 1:1 or well on their way to becoming just that. We know the power of the digital world for the social side of our lives but in this case makes sure you are well-versed in how being a digital native will support instruction and empower your future students well into their learning. Being knowledgeable of the resources out there will separate you from your peers. 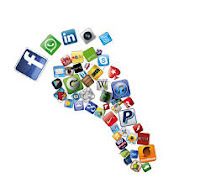 Model the importance of being digital with others. 3. Be Innovative. Hopefully while student-teaching there was an opportunity to truly dive into the role of teacher. If you were lucky enough to get an innovative cooperating teacher then by all means don't hold back! Try new things, take risks, fail and try again. As a substitute always have a quick mini-lessons on hand in the event you get an assignment in which the teacher did not leave plans, students finish the plans early or you just have a chance to get creative with your content. Be innovative in every sense of the word. 4. Bring Passion. After spending countless hours being in classrooms as an administrator it is quick to recognize teachers that bring passion to their work day in and day out. As you are feeling your way through your current experience, make sure that your passion for teaching and learning is evident. Let others see your passion and bring that spirit with you each day that you are fortunate enough to be in front of students. Your passion is crucial to your success. 5. Do Your Part. Being a pre-service teacher comes with some stereotypes that are as old as the profession itself. Avoid the trap of being considered less than the staff's equal when it comes to your interactions. If there is an opportunity to take on a role among colleagues, hop right in. Show your willingness to get involved and take initiative. The reward is two-fold. A position could open within the building you're doing your field work or you could simply wind up with some on-the-job training for your future employment. The return is priceless. 6. Ask Questions. I have yet to run into a pre-service teacher that asked too many questions. Be inquisitive and deepen your knowledge of the profession over all. Imagine all of the insight you can gain by talking with teachers from across the building, departments and grade-levels. Remember, you need to know, and they have many of the answers you seek. 7. Learn. Above all else, show your willingness to learn. And, be willing to share when you have failed and what you did to overcome adversity within that moment. Show not only what you do know, but what you are willing to be taught. Learning is at the heart of what we do. And, to get where we are, we have to make countless mistakes as part of the journey. We are better for it. 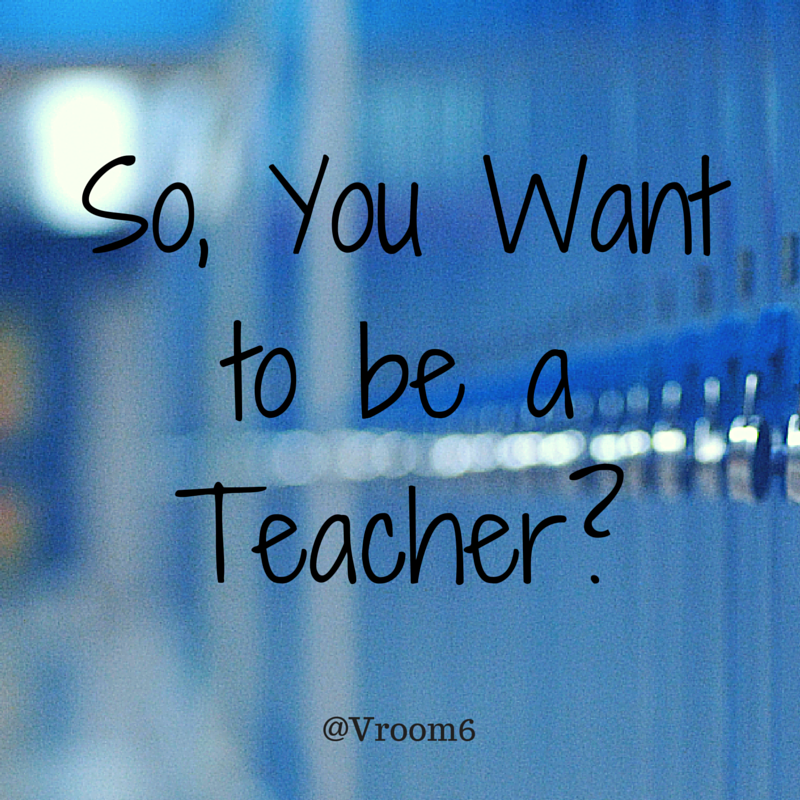 Being a teacher requires a skill set that is unlike any other profession out there. Our job is not for the faint of our heart. We chose this path as an opportunity to serve others. We are here to serve our students and our community. Whether a pre-service teacher or a substitute that is anxiously awaiting that first opportunity, make sure you are doing everything within your ability to get yourself positioned to be the candidate selected. Lead with your heart, believe in yourself and always, always know that we teach because we believe in the spirit of the child.